I have always wondered why our species Homo sapiens, that evolved in Africa about 200,000 years ago, seemed to do nothing special for the first 150,000 years. Because it is not until about 50,000 years ago that the first sign of creative thinking emerged with beautiful cave paintings found in Spain, France and Indonesia. Around the same time a new sub-species referred to as anatomically modern humans or Homo sapiens sapiens appears. Anatomically modern humans were more slender than their earlier ancestors; they had less hair, smaller skulls. They looked basically like us. But these changes weren’t just cosmetic. Two recent papers throw some light on how the revolutionary development of smaller and more fine-boned humans influenced the growth of cooperative culture, the birth of agriculture and human dominance of the planet. The first is an analysis of the fossilised skulls of our ancestors during this transitional period, carried out by a team led by Robert Cieri at the University of Utah and published in the journal Current Anthropology. 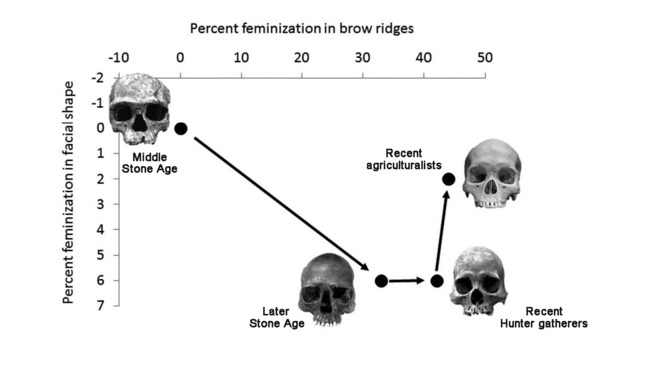 Cieri and colleagues found the brow ridge (the bony bit above the eye sockets) became significantly less prominent and male facial shape became more similar to that of females. They referred to this as craniofacial feminisation, meaning that as Homo sapiens slimmed down their skulls became flatter and more “feminine” in shape. They think this must have been due to lower levels of testosterone, as there is a strong relationship between levels of this hormone and long faces with extended brow ridges, which we may perceive today as very “masculine” features. People with lower levels of testosterone are less likely to be reactively or spontaneously violent, and therefore this enhanced social tolerance. This has a huge knock-on effect. As seen among humans today, we live in populations with extremely high densities with an incredible amount of social tolerance. So a reduction in reactive violence must have been an essential prerequisite for us to be able to live in larger groups and develop cooperative culture. The idea that humans became more feminine, less aggressive and thus could cooperate in large groups is certainly very intriguing as it would have allowed individuals with different skills to be valued and be reproductively successful due to the reduction of particularly male-male violence. In most primates the physically strongest male tends to dominate, but in early humans the smartest or the most creative males may have come to the forefront. The question remains, how did we become more feminine, less violent and more creative? A second paper in the journal Animal Behaviour led by Brian Hare at Duke University may throw some light on to this. He and colleagues compared chimpanzees (Pan troglodytes) and bonobos (Pan paniscus) in West Africa, two closely related species living in very similar environmental conditions either side of the Congo River. One key distinction between the two species is the size difference between males and females, their “dimorphism”. Male chimps are significant larger than females, whereas the difference in bonobos is much smaller. This difference is driven by different levels of testosterone. The size is just one manifestation of deeper differences that also show up in how the animals interact with one another. Chimpanzees, particularly males are very aggressive, but violence within or between groups is almost non-existent among bonobos. As both these species have a common ancestor there must have been strong selection going on to feminise the bonobos. Hare and colleagues suggest a process of self-domestication whereby violent individuals are punished and prevented from reproducing. The traits exhibited by bonobos are very similar to the changes observed in species that humans have domesticated such as dogs, cows, guinea pigs and foxes. They postulate the reason why bonobos were able to feminise and chimpanzees did not, is because on the Eastern side of the Congo where the chimps live they are in direct competition with gorillas, whereas the bonobos on the western side have no competition. Harvard professor Richard Wrangham, a co-author of the Hare paper, suggested in a recent talk that the same process may have happened to early humans. This feminisation through self-domestication may not only have made humans more peaceful and evenly sized, but may have also produced a more sexually equal society. A recent study in the journal Science by colleagues of mine at UCL showed that in hunter-gatherer groups in the Congo and the Philippines decisions about where to live and with whom were made equally by both genders. Despite living in small communities, this resulted in hunter-gatherers living with a large number of individuals with whom they had no kinship ties. The authors argue this may have proved an evolutionary advantage for early human societies, as it would have fostered wider-ranging social networks, closer cooperation between unrelated individuals, a wider choice of mates, and reduced chances of inbreeding. It may have only been with the rise of agriculture that an imbalance between the sexes reemerged, as individual men were suddenly able to concentrate enough resources to maintain several wives and many children. Indeed the Robert Cieri led study does show slightly more masculine facial shapes emerging in recent agriculturalists relative to early humans and recent human foragers. So at the moment we have some tentative hints of what may have happened between 50,000 and 10,000 years ago. Humans may have undergone self-domestication and over many generations weeded out those individuals that were unable to control their reactive violence. This is not as far-fetched as it sounds – studies of the Gebusi tribe in Papua New Guinea by Bruce Knauft showed significant levels of male mortality due to the tribe deciding that an individual’s behaviour is so intolerable that for the good of the tribe they must be killed. So human proactive violence – that is, thought out, discussed and planned violence – is used to curb, control and cull reactively violent individuals. This process combined with female mating choices over thousands of years could have selected for males with lower testosterone and more feminine features, which leads to a much more gender-equal society and the start of our cumulative culture. Mark Maslin is Professor of Climatology at UCL. This article was originally published on The Conversation. Read the original article.